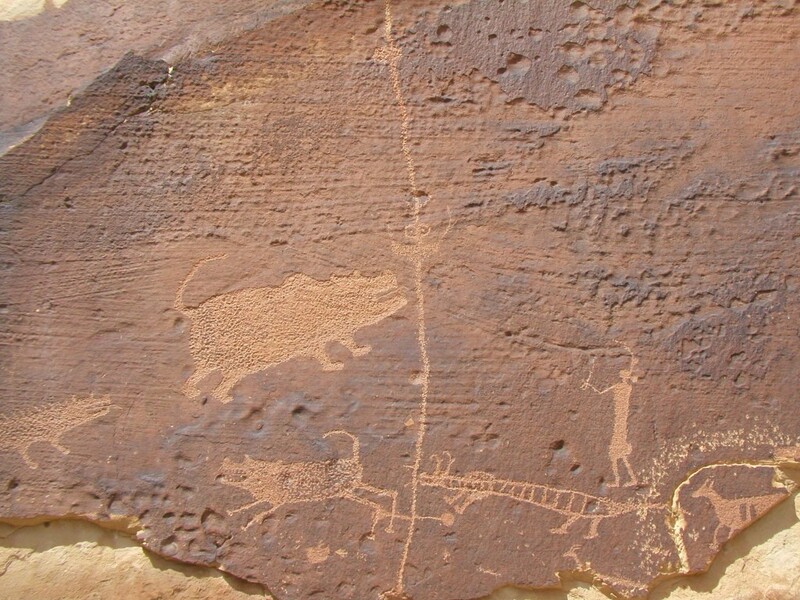 Much of the Southwest rock art is credited to the Fremont and Anasazi Indians, but the oldest rock art on the Colorado Plateau was not left by the Anasazi or Fremont Indians, but by Indians of the Archaic Period. Archaic Indians were nomadic hunter-gathers. Indians of this period lived in caves and in small brush shelters. Some of the Southwest canyon country’s most spectacular rock art is attributed to Archaic Indians. The Archaic Period ended with the introduction of corn in the Southwest. One of the best examples of Archaic Indian rock art is in Barrier Canyon (renamed Horseshoe Canyon) in central Utah. Barrier Canyon pictographs and Fremont Indian petroglyphs can sometimes be found on the same rock art panel. Fremont Indian rock art is often positioned on game trails and commonly depicts mountain sheep, hunting weapons, and trapezoidal human figures. Trapezoidal figures with arms are typical of Fremont Rock Art. Fremont rock art is divided into two categories: petroglyphs and pictographs. 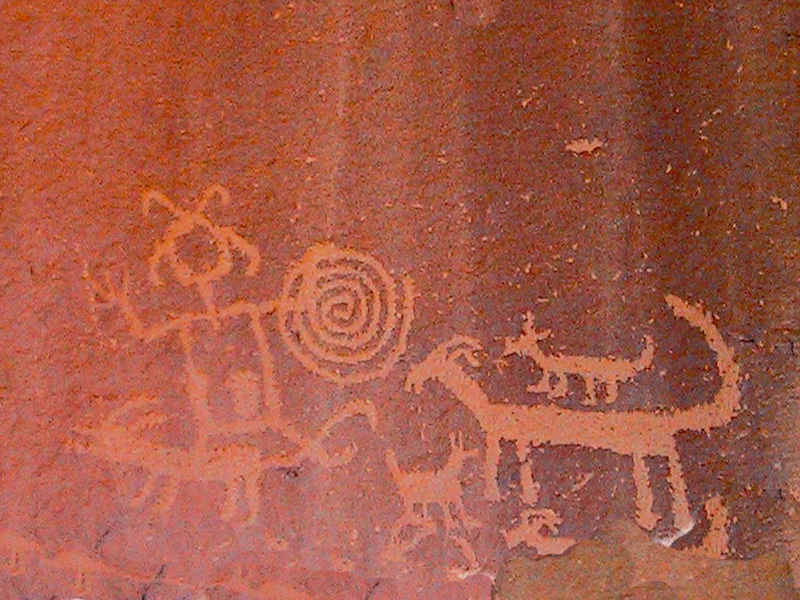 A petroglyph is an image or design cut into a rock surface without the use of pigment or coloring. In canyon country, desert-varnished sandstone was most commonly used. In desert areas, this brown or black varnish builds up on rocks after prolonged exposure to the elements. The tool usually used to produce petroglyphs was agate, chert, or jasper. Pictographs are painted on light-colored sandstone surfaces. A mixture of sumac, yellow ochre, and pinyon gum was used to make a black powder; yellow from rabbit brush., and red from red ochre or the roots of mountain mahogany. Animal fat and plant oils may have been used to bind the powders together. Fremont Indian artists used their fingers, dog hair or yucca fibers brushes, and hollow bird bones filled with pigment. This primitive bird bone “spray gun” was often used to spray around a hand placed on the rock. 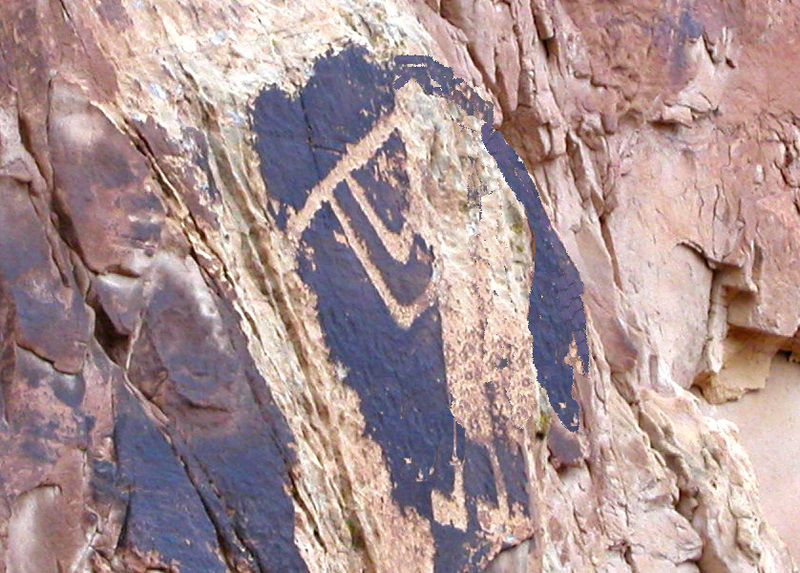 The Fremont used the figure of Kokopelli, a humpbacked flute player, in petroglyphs several hundred years before the Hopi were a people (Barnes). Some archaeologists suggest the humpback is a pack, and Kokopelli the flute playing peddler from Mesoamerica. Religious functions are ascribed to some of the painted and sculpted figures on rock art panels, but the purpose and meaning is known only to the creators. 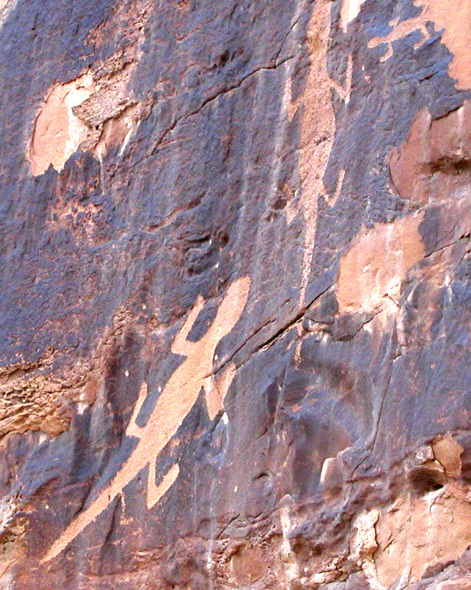 Rock art pictures are interpreted as depicting concepts of wild resource, fertility, and hunting magic (Stone). There are also petroglyphs of significant events. Note: this is a breach birth…the babies feet are out of the sack. The above Chaco Canyon petroglyph and the Fremont petroglyph shown below demonstrates the superiority of Fremont rock art over Anasazi rock art…compare the detail in the figures. 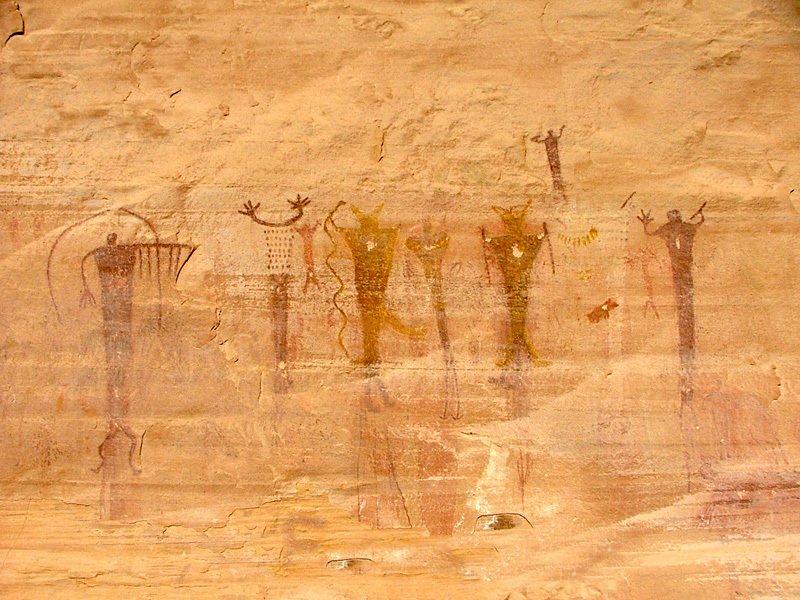 The Anasazi built the great houses and kivas, but the Fremont Indians excelled in rock art. 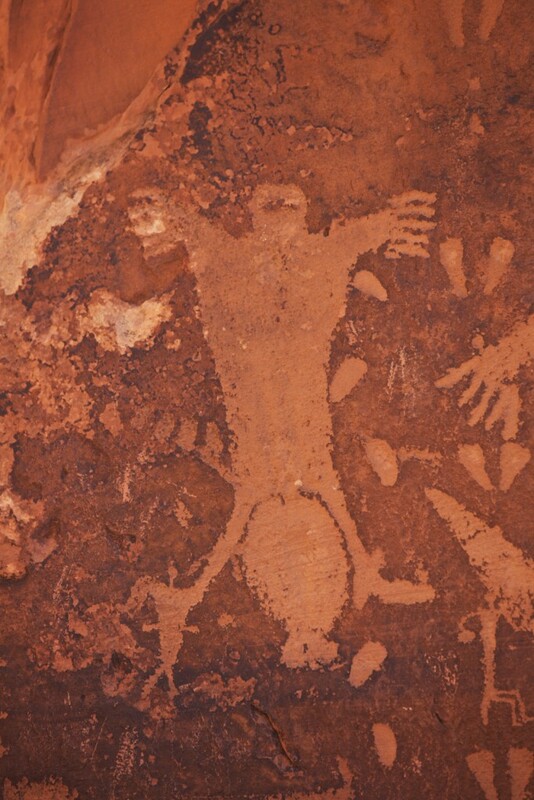 There is no way to determine if this lizard is contemporary with other Fremont petroglyphs, but the figure is carved with the same skill as figures of Fremont origin (Schaafsma). 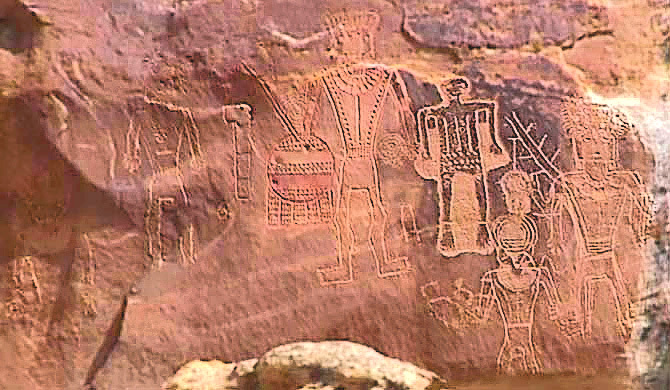 The Three Kings rock art panel is located on the McConkie Ranch outside of Vernal, Utah. There are at least six visible figures. The lower parts of these figures are not the typical trapezoid figure and may have been added by subsequent rock artists (McConkie Ranch). Mr. Jacobs describes the panel he photographed with a telephoto lens. The Three Kings Panel is about 125 feet above the cliff base. The nearest photography position is a six inch ledge on the cliff face. The largest figure is well over six feet tall. I assume the circle is about 32 inches, as are other large circles I have measured in the area. The major figure in the Three Kings panel is referred to as the Sun Carrier. Several of the rock art pictures on this site were taken by James Q. Jacobs, and I thank him for making his website on Indian rock art work available to internet users. The next petroglyph is not on the Three Kings Panel, but is nearby. Jared Robison pointed out I had labeled the Big Foot petroglyph as the Three Kings. The articles on this web site are written for me to learn more about an interesting subject, so I appreciate it when an error is pointed out. 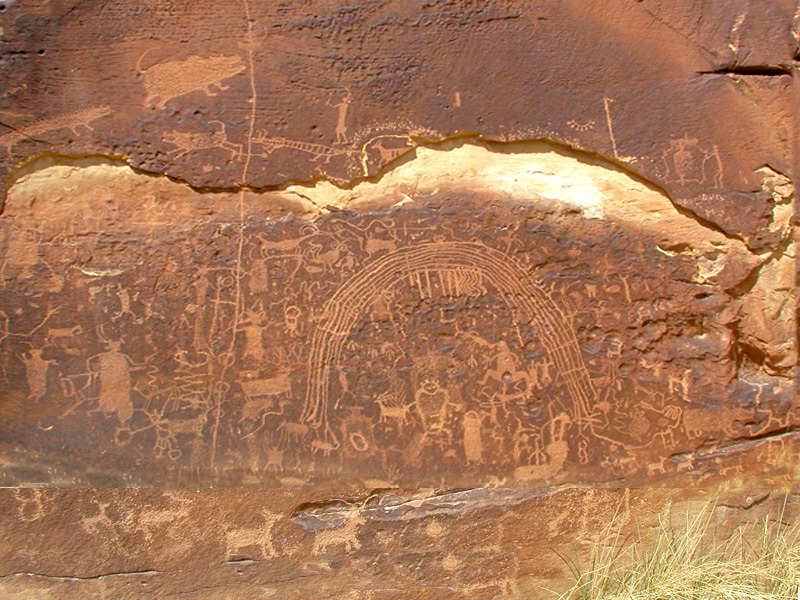 The Rochester petroglyph panel is on Rochester Creek between Emery and Castle Dale, Utah. Note the woman giving birth just to right of center on this panel. 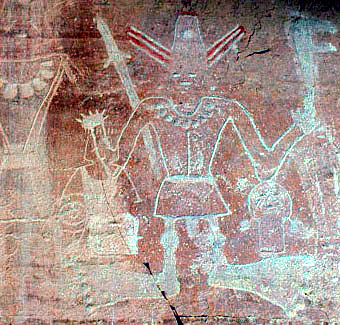 The vast majority of the pictographs on this panel are from the Fremont period, but there are several questionable figures on the top of the panel. Dr. Polly Schaafsma states that Dr. Gunnerson (1969, p78) is of the opinion a number of these creatures, particularly the hippopotamus and alligator like creatures are of recent derivation. She goes on to add field inspection indicates, on the basis of patination and technical execution, these figures are not recent and are an integral part of the original panel. I agree with Dr. Gunnerson. 1) Indians of the Fremont era, or any Indians from the southwest, could not have knowledge of these animals. Some have suggested they were drawn based on fossils, but you don’t find complete fossils of animals that size…scientists spend years collecting bits and pieces of bones to reconstruct what they think an animal looked like. 2) As for technical execution, there is a difference in the figures. On the questionable figures, the edges are too straight and are from 1/16th to 1/8th inch deep. The spines on the crocodile-like figure are perfectly straight lines. Lines this fine and straight were probably made with a sharp metal chisel, not from pecking with stone tools…compare the outlines of other figures on the panel. Likely candidates for doing this might be historic Indians (Shoshone, Paiute), college students with one of the geological surveys, or some other would be artist….College students with the Hayden Party that surveyed Yellowstone and the surrounding areas are thought to have left marks on several rocks, i.e. William Clark’s name near Swan Valley, Idaho, and the Colter Stone in the Teton Valley of Idaho. 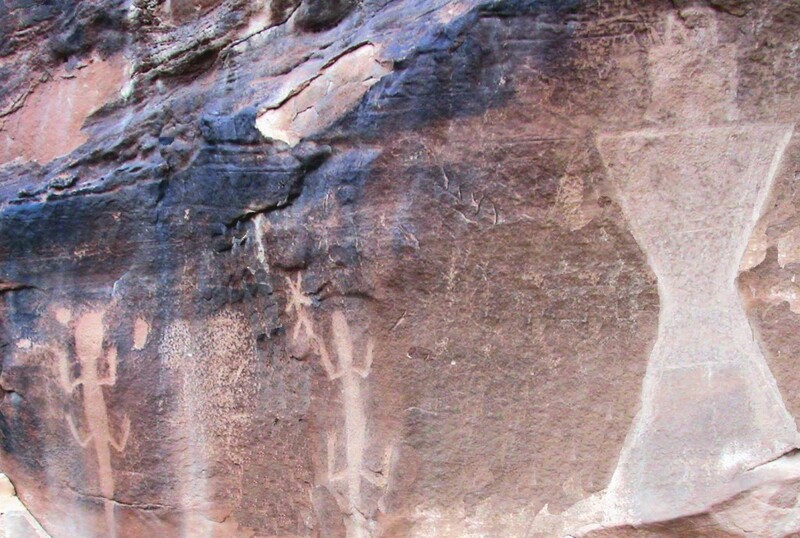 Because rock art is one of the most visible and fragile cultural resources in Utah, it has also been subject to vandalism and destruction…some jerk put his initials and shot the woman giving birth on the Rochester Panel. Rock art must not be touched; oils from human skin can discolor and eventually obliterate the designs. The Archaeological Resources Protection Act of 1979 and the Antiquities Act of 1906 protect rock art. This Fremont panel, containing pictographs and petroglyphs, demonstrates the sheer stupidity and destructiveness of too many people. This remarkable rock art panel, which shows little change over several hundred years, is now covered with names and initials. Some archaeologists have proposed the holes in the heart area are for the spirit to escape. Dave Summers of Las Vegas sent a picture of the panel after it was restored by a joint project of the citizens of Emery County, Utah and the BLM. In 1996 the State of Utah wanted every county to do some sort of “Centennial Project”. Emery county opted for the Buckhorn Wash panel restoration. So with local fundraisers and additional money from the state, they hired a person who was well known as one of three people nationwide capable of undertaking such a restoration project. Her name was Constance ‘Connie’ Silver. With the aid of dentists drills, various brushes and chemicals, as well as native elements such as resins, soils and plants for dyes, she was able to imitate or duplicate the original ‘paints’ used by the original ‘artists’. After roughly six weeks, she and her aide completed the restorations. After which time, the county and BLM moved the roadway a little farther away from the panel to enable them to build fencing, pathways and information kiosks. A year or so ago, some moron wrote something on the panel with charcoal, then after finding out the law was after him tried to use mud to clean it off. They hired Connie to come back and get rid of the damage, and while she was there she did a little touching up of some of the previous restoration. They did catch the guy and he was prosecuted. And I was glad to hear he got quite a hefty fine out of it. Rock art cannot be dated accurately by any technique presently known. 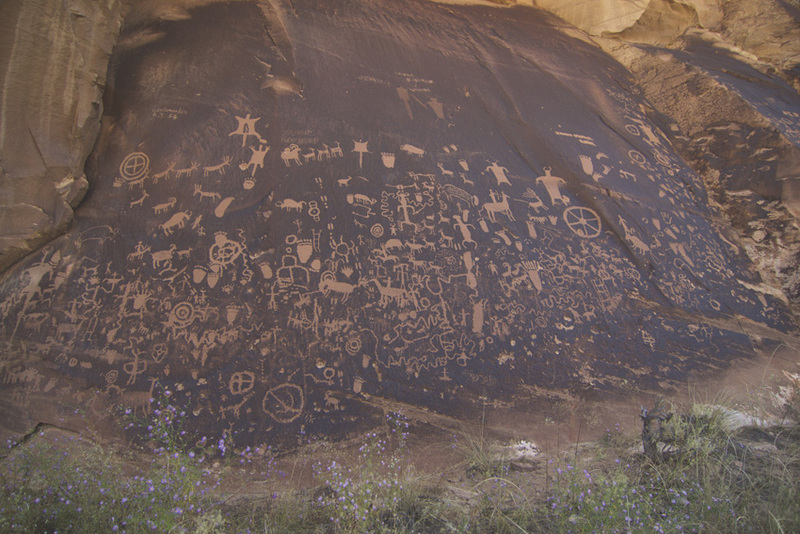 As can be seen from Newspaper Rock in Canyonlands National Park, the petroglyphs vary from several thousand years old to three hundred years ago or less…note the Indian on a horse. The Ute Indians were the earliest Indians to have horses in the canyonlands area, and that wasn’t until after the Pueblo Revolt of 1680. The first recorded Europeans to enter southeastern Utah with horses and mules was the Dominguez Escalante Expedition in 1776. The meaning and purpose of rock art remains a mystery (Madsen). There is no universally accepted interpretation among archaeologists. Explanations range from a form of written history to doodling. Only the artists knew the meaning of the images. In addition to the prehistoric Native Americans, the Ute, Paiute, and Goshute created rock art. The historic Shoshone rock art is limited, and concentrates on geometric patterns, especially concentric circles and geometric scratches on rock faces (Stone). Modern Numic (Shoshone) groups do not know its meaning and hunting magic is not important to them. Besides rock art, a unique artifact left by the Fremont Indians are clay figurines. The small figures that resemble people, often showing intricate details, such as ear bobs, necklaces, clothing, hair and facial decorations, and sexual characteristics. The purpose of the figurines is unknown, but they were cared for with such great reverence that it indicates a religious significance. The Fremont Indians had outside ceremonial places for small gatherings, but they did not build kivas (Barnes). By A.D. 1350, the Fremont culture was gone from the Great Basin and northern Colorado Plateau. The abandonment started as early as 950 A.D. in the northeastern edge of Utah with the Uinta Fremont. After the Fremont Indians left, the canyonlands were unoccupied for hundreds of years. 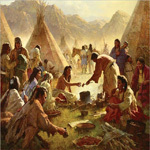 The historical Native Americans of the Great Basin and northern Colorado Plateau are relatively recent arrivals (Stone). There is still a question of what happened to the Fremont Indians. Some archaeologists believe the Fremont Indians were starved out, or forced out to the north and east. The evidence is not conclusive, but Barnes states that the nomadic Fremont Indians were partially responsible for the Anasazi abandoning the four corners area. This seems reasonable, what is not reasonable is an aggressive, nomadic culture is going into the Rocky Mountains or Great Basin deserts when there is a readily obtainable Anasazi food source to the South. Dr. Gunnerson postulates the Uinta Fremont become the Ute Indians, while Barnes postulates the Fremont Indians merged with a band of Shoshone and then become the Ute Indians. 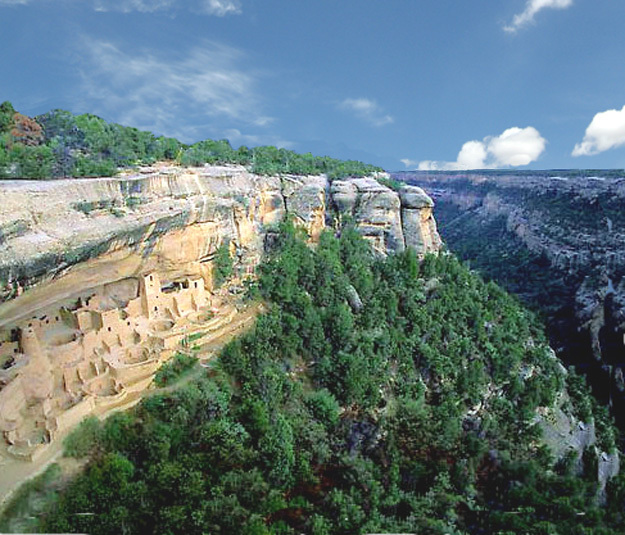 In the cliff dwelling, the Anasazi were safe, but from there they could not protect the crops on the plateaus or the valley floors. The pacifist farmer’s fields of corn, squash, and beans were easy targets for Fremont raiding parties. The Navajo and the Apache arrived in the southwest between the fourteenth and fifteenth century. Anthropologists who specialize in languages believe these southward-drifting nomads were of Athabascan stock, from northwestern Canada and the Alaskan interior. The Paleo-Athabascan tribes came to America across the Bering Strait in a second wave of migration around 6000 B.C. (Stone, Dillehay). The Navajo claim much of the Anasazi lands and some of that which was occupied by the Fremont Indians. The Hopi Reservation is located within the present day Navajo Reservation. A series of treaties imposed upon the Hopi and Navajo by the Federal Government has led to a territorial dispute rooted in more than 500 years of cultural history. The Rock Article was written by Ned Eddins of Afton, Wyoming.